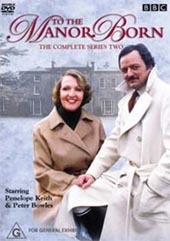 The next installment in this massively popular series starring Penelope Keith and Peter Bowles, To the Manor Born is the tale of a "Lady of the Manor" Audrey fforbes-Hamilton and her relationship with nearby neighbour Richard DeVere as she struggles to cope with the fact that her life has been altered somewhat dramatically. Originally aired in 1979, this is the type of comedy that we dont really get to see too much of nowadays. It was a gentler time for comedy where the humour was in the well written scripts and didnt solely rely on crassness to get a cheap laugh. The beauty of this series was in how Audrey was so offended that Peter, a mere supermarket chain owner could possibly buy and move into an area such as the one that she lives in. Add to that the fact that he's bought her family estate that she's had to sell in order to live and you are in for a lot of laughs from this opinionated lady. When you take all that and add to the fact that Peter is not even British then it just gets better and better the whole way through. Despite the initial encounters which leave a bit to be desired, it soon becomes apparent that there is going to be an awkward relationship of sorts that is very endearing. They have a delicious game of cat and mouse in which you are just aching for them to get together. There are only 6 episodes in the series spanning two discs, however you also get the Christmas Special and some extras including filmographies and an interview with writer Peter Spence that are well worth checking out. Great stuff.